From the time each of the daughter's were pg, I always said I wanted a "bad boy". Well, seems Tucker and Jack are doing me proud. Abigail was caring for them last weekend and she took a phone call that was from one of their computer game people. Seems the boys had decided to put all their "shares" together in this computer game and have more points. (we didn't raise any dumb kids) Well, the excessive points set off an alarm at the "keeper of the points" job and they called to say the boys would be banned from that particular game for a month. Abbi was appalled at that decision, (perhaps she remembered her and Joycie make a call to 911---now that's bad) and said'"...they're only 11." Couple of lessons here; maybe the job market isn't as bad as they want us to think. Imagine getting paid to watch points on a computer game rise above a certain level. It's probably a state job, so they do only work 4 days a week now. The other thing---I GOT MY BAD BOYS! I'm a Gemini, What are You? 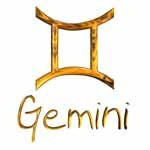 Gemini is symbolized by the Twins. You're flexible, flirty and inventive. Intelligent to the extreme, your idea of a good time is a lively conversation -- or better yet, a friendly debate. Thanks to the Twins' influence, you sometimes feel split in two directions and don't know what to do! Hey Follow My Blog, I may post something you like. I am a teacher and an artist. A nurse and mother. A storyteller and spiritual being. I am wife and a friend. I am a journal keeper determined to record my celebrations, my loves, my losses. I am a traveler, but not alone. I am learning to trust and believe and I know I will find that which I have been searching for all of my life--- I am a poet and a dreamer. I am a grandmother and a therapist. I dance, I sing and I am a child of God's.